Shrimp moves along a production line at a frozen seafood company in 2010. Measured by environmental impact, a humble shrimp cocktail could be the most costly part of a typical restaurant meal, scientists said Friday. Measured by environmental impact, a humble shrimp cocktail could be the most costly part of a typical restaurant meal, scientists said Friday. If the seafood is produced on a typical Asian fish farm, a 100-gram (3.5 ounce) serving "has an ecosystem carbon footprint of an astounding 198 kilograms (436 pounds) of CO2," biologist J. Boone Kauffman said. A one-pound (454-gram) bag of frozen shrimp produces one ton of carbon dioxide, said Kauffman, who is based at Oregon State University and conducts research in Indonesia. He told a meeting of the American Association for the Advancement of Science that he developed the comparison to help the public understand the environmental impact of land use decisions. Kauffman said 50 to 60 percent of shrimp farms are located in tidal zones in Asian countries, mostly on cleared mangrove forests. "The carbon footprint of the shrimp from this land use is about 10-fold greater than the land use carbon footprint of an equivalent amount of beef produced from a pasture formed from a tropical rainforest," wrote Kauffman in a paper released to AFP, not including emissions from farm development, feeds, supplements, processing, storing and shipping. The farms are inefficient, producing just one kilogram (2.2 pounds) of shrimp for 13.4 square kilometers (five square miles) of mangrove, while the ponds created are abandoned in just three to nine years because disease, soil acidification and contamination destroy them, he wrote. After abandonment, the soil takes 35 to 40 years to recover, he said. Emily Pidgeon of Conservation International said intact mangrove forests are of value in protecting the coastal ecosystems and communities against storms and tsunamis, such as the Indian Ocean tsunami in 2004 that killed some 230,000 people. The problem, she said, is the value of intact mangroves is hard to measure, and most of the shrimp farms are in impoverished areas that cannot easily afford conservation. "It's difficult to find the financing to do it, or the political will," she said, adding Kauffman's carbon measurements provide another argument in favor of protection. The catchy shrimp cocktail estimate is part of the relatively new field in science and economics called ecosystem services, which uses models to measure the value to human communities, in economic terms, of forests, grassland, waterways and even the air. "To present how deforestation and land cover change contribute to global climate change in a comprehensible manner, we change the scale of greenhouse gas emissions from global to personal scales," wrote Kauffman. Funny I seem to remember an article here on Physorg about super-intensive stacked raceways. "The shrimp grow in huge enclosed tubs called raceways, stacked four high in a column. As the shrimp develop and grow under computer-controlled conditions (the water is carefully circulated but not completely renewed, keeping environmental costs and water usage in check), they are moved downward from one raceway to the next--baby shrimp go in the top and progress downward to the bottom raceway, from which they are eventually harvested. That innovation--the ability to raise very large, protein-rich shrimp (theyre called U15, but you probably know them as jumbo) in very little water--means the kilo-per-cubic-meter numbers are through-the-roof: 25 kilograms of shrimp from just one cubic meter of water. 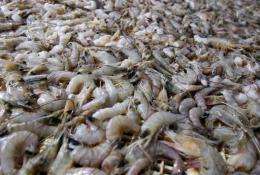 For some perspective, thats equivalent to 1 million pounds of shrimp per acre." This is just an example, when monetary economy is not able to judge the exact cost of good, until it's not expressed in real money. The Laissez-faire economy always operates in real, actual prices only, so it cannot consider the long term effects by its very nature (which leads into its temporal instability and periodical economical crisis, BTW). This is not about superiority of socialistic approach to economy, rather about importance of mutual duality and balance of both approaches. In general, the monetary economy isn't effective for solving of questions at general scale (like the global warming) and vice-versa: the socialistic approach fails in control of economy at its local, communal level. Only fools would eat farmed shrimp because of the crap they feed them. If we all stopped eating them the problem would go away. PeterD is right. Anyone who eats especially Asian farmed seafood is asking to get sick. Even US farmed seafood isn't good either because of the cra- they feed them. Also there is NO WAY this article is correct. The numbers are so wrong.